This year our programme for the Folk Film Gathering (29th April to 13th May at Edinburgh Filmhouse and the Scottish Storytelling Centre) consciously sets out to try to challenge what we think of in Scotland when we think of ‘the folk’. In particular, our choice of films this year looks to challenge the idea that ‘the folk’ and ‘folk cinema’ are necessarily dominated by the experience of men. Amber Collective’s rousing The Scar (Filmhouse 7th May) looks at the story of May, one of the many woman who played a pivotal role in the 1984 miner’s strike, as she deals with community disillusionment, a failing marriage and an oncoming menopause. Elsewhere Aldona Watts’ Land of Song (Filmhouse, 8th May), celebrates a group of indomitable women in rural Lithuania who – through careful preservation of the region’s songs, stories and customs – have become the custodians of its history. Laulu (Filmhouse, 9th May), made by a Finnish feminist filmmaking collective led by Oscar-nominated director Selma Vilhunen, documents the process through which Hanneriina, a mysterious young woman, takes on the responsibility of Finland’s ancient rune-singing from Jussi, its last living exponent. We’re also challenging the sense this year that ‘the folk’ must be traditional, or – to put it another way – we’re questioning what it means for a community to be ‘traditional’. Charles Burnett’s brilliant Killer of Sheep (Filmhouse, 2nd May) – one of the key influences on Barry Barclay’s luminous Oscar winner Moonlight – looks at the interlocking lives of an inner city black community dealing with the crippling weight of hard labour and grinding poverty. Whilst the film looks unflinchingly at what is missing from its character’s lives with a quiet, excoriating sense of anger, Burnett frames his community within the enormous richness of black American music, mixing Paul Robeson with Scott Joplin, Earth Wind and Fire and Dinah Washington. We might not consider Earth Wind and Fire to be ‘traditional music’ in the same terms that we usually think of traditional culture in Scotland –yet are they not part of a proud, unbroken tradition of black American music and popular culture just the same? Our programme this year also challenges the idea that ‘the folk’ have to be bounded to a particular sense of place. Whilst many of our films look at deep, specific connections between a particular community and a settled sense of place, Tony Gatlif’s spellbinding Latcho Drom (Filmhouse, 11th May) looks at the scattered diaspora and many emigrations of Romany peoples from Rajasthan and Egypt to uneasy new homes across Europe. Part road move, part folk musical, Latcho Drom shows us that whilst the Romany community may be scattered and often brutally marginalised on the fringes of European metropolitan centres, they retain a proud, powerful sense of continuity and collectivity. Gatlif’s film – one of the great masterpieces of European cinema – celebrates the rich musical culture of Romany communities in all its diversity and finery, whilst never shying away from the persecution and injustice such communities face. Perhaps most importantly in 2017, our programme challenges the idea that ‘the folk’ need to all be culturally, ethnically the same. John Sayles’ masterful Matewan (Filmhouse, 3rd May), perhaps the best film about the labour movement I’ve ever seen, explores the way in which a number of very different communities – the striking white American miners working for the Stone Mountain Mining Community (in the small town of Matewan where the film takes its name), and the black American and Italian immigrant workers shipped in by Stone Mountain as cheap labour– come together to forge a tentative yet hard-won sense of collectivity. A powerful fable that’s as accomplished in its grasp of cinematic poetics as its incisive perspective on labour politics, Sayles’ film seems as relevant today as when it first came out in 1987. Matewan suggests that whilst such solidarities are intensely difficult, precarious and fraught with compromise, they remain essential in establishing a collective resistance to the predatory agents of neoliberal capitalism. So: the images of ‘the folk’ projected by the 2017 Folk Film Gathering show us that whilst ‘folk cinema’ can if course focus on male experience, such as the trapped miners in The Brave Don’t Cry and the fishermen in Barrovento (Filmhouse, 1st May), it can equally focus on women’s experience – in The Scar, Another Time, Another Place (Filmhouse, 6th May) and Milk of Sorrow (Filmhouse, 10th) and the many other screenings this year in which the role of women in communities is placed front and centre. Whilst ‘the folk’ and their identity can be tied to a very specific place like the formidable women in Land of Songs, they can also be diasporic and in transit like the Romany communities in Latcho Drom. ‘The folk’ can be strongly, overtly traditional like the singers in Laulu or Blackbird (Filmhouse, 29th April), or their traditions and sense of cultural continuity can be more complex and harder to see, yet every bit as valuable, as in Killer of Sheep. And finally: whilst ‘the folk’ can indeed all come from the same place, like the Fife mining communities of The Happy Lands (Scottish Storytelling Centre, 1st May), they can equally be as culturally and ethnically diverse as the communities who come together to fight the Stone Mountain corporation in Matewan. So – come-all-ye! 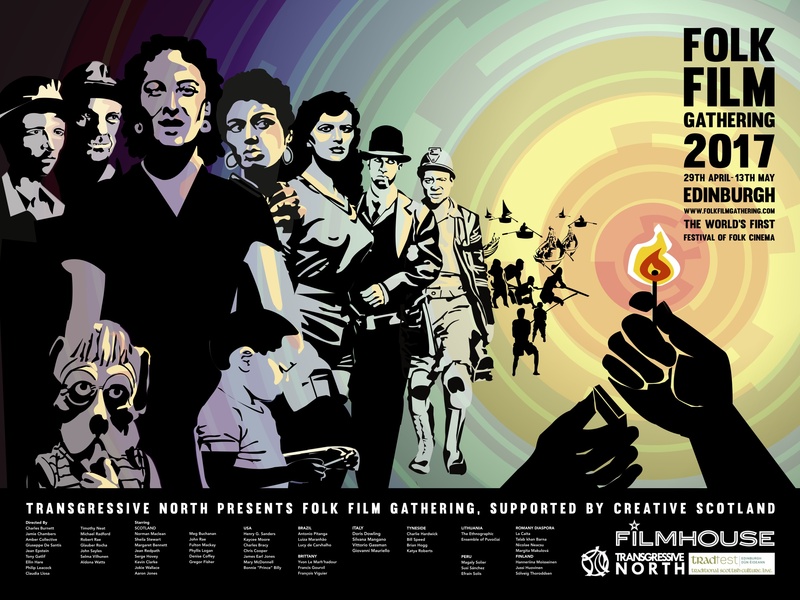 As an increasingly dis-United Kingdom limps towards another election, come and celebrate with us the hard-won importance of solidarity, collectivity and common experience at the 2017 Folk Film Gathering. There’ll be live music before almost every screening (from the McTaggart Scott Brass Band, from Polish women’s singing group Davno, and from a cast of brilliant Scots folk singers such as Jess Smith, Steve Byrne and Radio Two’s recently crowned Folk Musician of the Year, Rachel Newton), discussion sessions, visiting filmmakers and a feast of rare Scottish and international cinema. We hope to see you there! It’s a cracking line up you’ve programmed for this, hope it gets the audiences it deserves. Women, women, women, women. How very Sturgeon’s Scotland. Guess men quite simply don’t count anymore. Sick of this country’s modern misandry. Yeah, Scottish society is just dominated by women isn’t it? When the blood had dried and the gun lay silent, the women wove what little was left to mend the broken and heal the madness. ‘Cry no more my baby, Daddy’s coming home’. Looking forward to this.